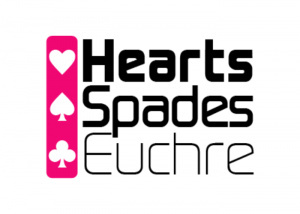 Card enthusiasts searching for quick and casual DSiWare fun are in luck with Hearts Spades Euchre from Cosmigo, the same company that brought us the surprisingly high-quality 505 Tangram. The studio returns here with another above average title with a modest, to-the-point name that risks seeing potential customers underestimate it and pass it by. But don't sell this release short – as it turns out, it pulls off the experience quite well. All three card games are designed for four players, Hearts and Spades proving somewhat similar as they both descend from Whist. 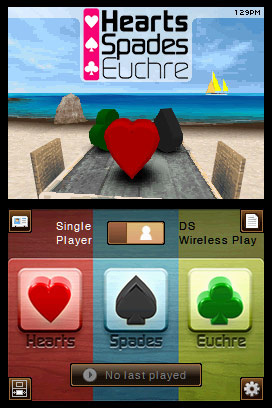 Both Spades and Euchre see teams of two face off, while in Hearts, each individual plays for him or herself. The manual one-ups some competition like 7 Card Games by allowing access in-game on the top screen while your cards display below, granting you an easy reference that you can quickly apply to your own hand. It makes no effort to make the jargon-filled rulebooks accessible to novices, however, nor is an in-game demonstration or tutorial available. The game displays which moves are available at which times, however, so newcomers won't find themselves completely lost. 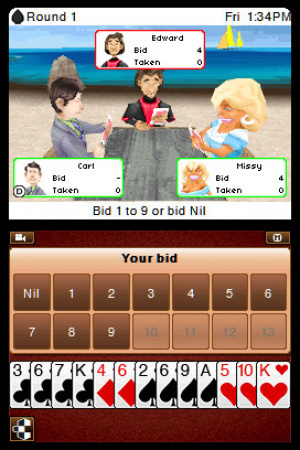 Impressively, you can implement a large number of special rules and variations within Hearts and Spades, enough to customise matches to your liking each time, though the same cannot be said of Euchre, where you can only alter the end score. The good points continue with multiplayer mode, allowing you to use either local wireless or Download Play to face off against one to three of your friends. You can even send messages between players, either typed or spoken into the system's microphone. While the former option will come in handy for team games against other human opponents, the latter will be useless to most as they'll likely play in the same room as each other. It's still a neat inclusion, though. For single player matches, you can pick between 15 cartoony competitors who range in difficulty between Easy, Medium and Hard, and the AI generally works quite well and takes little time to think of its next move. Very useful is the ability to save and return to a match in each game, your most recently played displayed on the main menu for easy access. You also pick your own avatar, but you can replace that with a photo of yourself using the DSi or 3DS camera. The art style has over-the-top polygonal characters sitting at a folding table on the beach, and all in all it's quite easy on the eyes and somewhat comical without ever feeling obnoxious. The presentation is uncluttered and clear to understand, and the music's relaxing, well-compressed and actually makes for a pleasant backdrop. The only major downside is obvious right from the title – you're only getting three games, two of which aren't entirely dissimilar. They've lasted as long as they have by allowing enough complexity to make every match a different experience from the last, however, so there's a good chance that you'll still find yourself satisfied with the package. 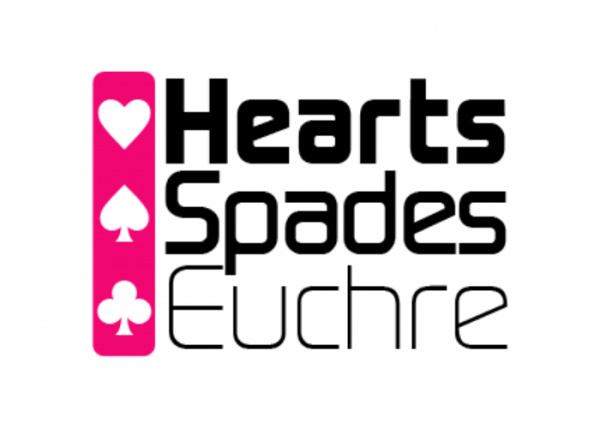 Sporting a clean presentation, rule variations, an in-game manual and both local wireless and Download Play for multiplayer matches with messaging supported, Hearts Spades Euchre is a great way to experience these classic card competitions. However, three games make for a somewhat thin collection, and novices should play with a friend and perhaps a real deck or look up instructions elsewhere instead of attempting to begin here or they risk becoming even more confused by the somewhat abstruse rulebook included. I'm not a card fan so I won't be getting this but good review though, Zach. Is euchre against the AI fun? This is a good game for the price. @jdarrell Yes, if you like the game in general you'll like playing against the cpu. The wait time between computer moves is short as well. I read a review online that said there aren't enough variants for the Euchre game. It even said the game uses a joker and that it's not possible to play without the joker. Is that true? How many options are there (bone the dealer, going alone, etc)? @Bullwinkle That's right - while there are many rule variations in Hearts and Spades, Euchre only allows you to edit the game end score. These aren't among my more favored card games, so I'll pass. Can you use download play to play 2 players vs the CPU in Spades? @slidecage In Hearts, you can set whether you're playing to a certain score or a certain round, what the score or round number is, if the deal leader holds the 2 of clubs or sits to the left of the dealer, what the pass scheme is from seven choices, if there are points on the first trick, if hearts must be broken, whether the queen of spades breaks hearts, whether shooting the sun is allowed, whether the jack of diamonds is needed to shoot and whether it subtracts points. In Spades, you can set the win score, the lose score, whether blind nil is allowed always, never, or if losing 100+, who leads the round (left of dealer, 2 of clubs holder or highest bidder), whether spades must be broken, whether you play spades on the first trick, whether 10-for-200 is allowed, whether moon is allowed and whether blind moon is allowed. Sweeeeeeeeeet. Euchre, I am totally in to this. I will get this as well! I like (virtual) card games.